According to Loehmann and Garmback, the officers arrived at the park, approached Rice and ordered him to hold up his hands at which point Rice reached in his waistband and one of the officers fired two shots, fatally hitting Rice once in the torso. The entire incident happened in less than two seconds. The officers later found that the gun was an Airsoft gun, which are air gun replicas of real guns and can shoot non-lethal plastic, ceramic, or metallic , which had had its orange safety tip removed. Deputy Chief Tomba stated that Rice did not threaten or point the toy gun at Loehmann and Garmback. Rice died the day after the shooting at MetroHealth Medical Center. A surveillance video without audio of the shooting was released by police on November 26 after pressure from the public and Rice’s family. It showed Rice pacing around the park, occasionally extending his right arm with what could be a gun in his hand, talking on a cellphone, and sitting at a picnic table in a gazebo. The video shows the officers’ patrol car pulling up beside the gazebo. Rice then appears to move his right hand toward his waist. Loehmann then gets out of the patrol car and shoots him from a distance of less than 10 feet (3.0 m). Neither Loehmann nor Garmback administered any first aid to Rice after the shooting. Almost four minutes later, a police detective and an agent from the Federal Bureau of Investigation, the latter of whom was working a bank robbery detail nearby, arrived on the scene and treated Rice. Three minutes after that, paramedics arrived and took Rice to MetroHealth Medical Center. Rice’s mother said that the toy gun had been given to him to play with by a friend minutes before the police arrived, that police tackled and put her 14-year-old daughter in handcuffs after the incident, and that police threatened her with arrest if she did not calm down after being told about her son’s shooting. A video obtained by the Northeast Ohio Media Group, released on January 7, 2015, shows Rice’s 14-year-old sister being forced to the ground, handcuffed and placed in a patrol car after she ran toward Rice following the shooting. It also shows that police waited for four minutes before providing any first aid to Rice. There will be donation boxes there for all the donations collected. Donations will be accepted all week the week of June 22nd-June 27th with emphasis on June 25th as the Day of Action. In addition to Toys, we are also accepting new or gently used kids’ clothing, books, small household goods, infant items (diapers, wipes, etc.) and new hygiene supplies. 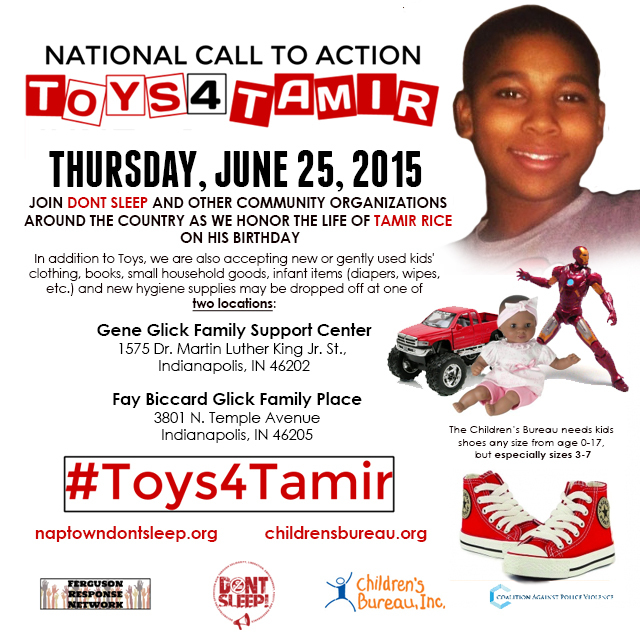 Out of respect for Tamir’s memory we ask that you DO NOT donate any toys which are guns or support military style violence. This includes water guns and Nerf guns as well. Listen to my parents, love, honor, and respect them. Study hard in school, strive to get excellent grades and reach my goals in life. I will remember the community and give back to it. I will always treat others as I would like to be treated. I will practice harmony, peace, and love.